In recent years CEOs have commonly handed off digital to CIOs or have hired Chief Digital Officers to own the digital realm. 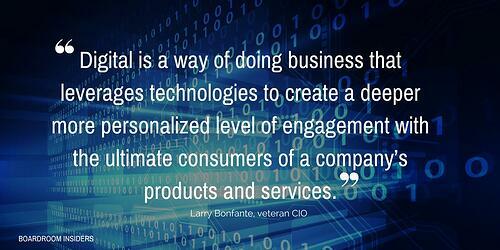 But as veteran CIO Larry Bonfante wrote in a recent piece for Heller Search Associates, they’ve got it all wrong. For every company trying to transform into a digital enterprise there likely is a misunderstanding of what digital is and the right strategic approach for embracing it. 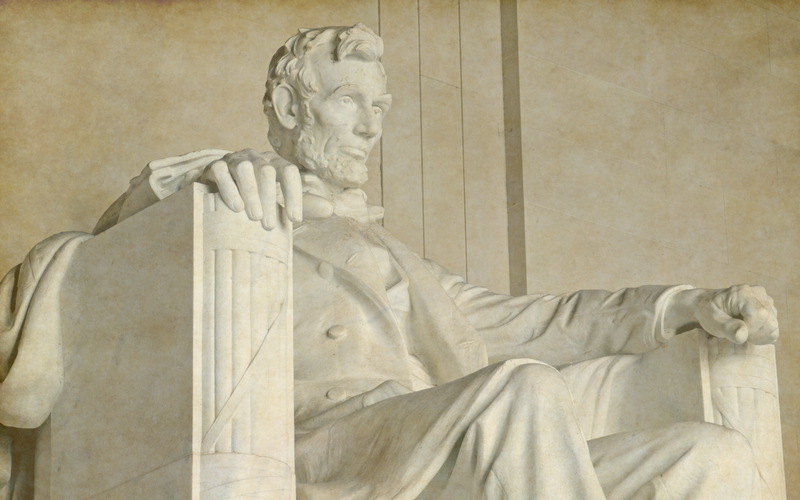 According to Bonfante, digital isn’t a “thing.” It doesn’t strictly belong in IT or marketing. It’s not a department. It isn’t something to hand off to developers. And, digital is not a job title. That means everyone in the C-suite will make decisions and take actions in the context of digital, because the digital economy touches everything, from leadership and revenue growth, to customer and employee engagement, operational efficiency, and workforce agility. For you, a vendor selling products and services, the implications are equally enormous. If you’ve strictly been courting the people in the CIO’s office you need to branch out. Technology impacts every C-Level executive or LOB leader, and if they aren’t doing the actual signing off on deals, they are influencers. While that realization may feel overwhelming, consider this, though. With thorough knowledge about the C-Suite, the business, and their priorities, you have the potential to guide them through terrain they may be unfamiliar with. 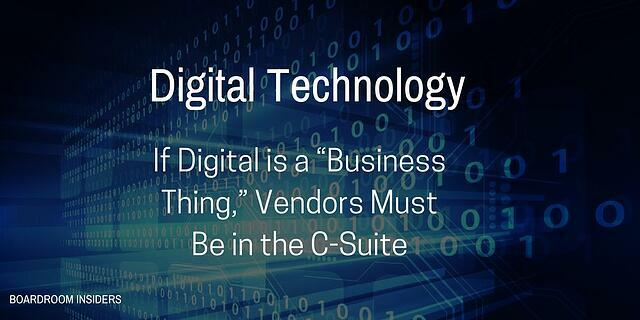 CIOs may be conversant in areas of the technology behind digital. So may CMOs and even some CEOs. But many C-Level decision makers across the organization may feel like deer caught in the headlights. They know they need to make smart tech decisions that align with the business but they don’t have the expertise. Doing research, asking questions (and really listening to answers), then offering suggestions based on your expertise that address their goals can turn you into a valued partner. This is not a one-size-fits-all proposition. You can’t just go in with a broad overview of the business. Each executive decision maker faces a unique set of challenges based on their responsibilities. But armed with the right insights, you are launched into the unique position of being able to delve into issues impacting each one and piece together a holistic view of that company’s digital transformation needs. You can then help them determine viable options that support both their specific goals and the overall organizational goals. If digital is “owned” by everyone, if the company’s mandate is truly end-to-end digital transformation, then your mandate in turn is to be attuned to the issues facing each of your prospect’s C-Suite decision makers. They’re going to need your help. Need help keeping up with the initiatives and priorities of your top prospects? 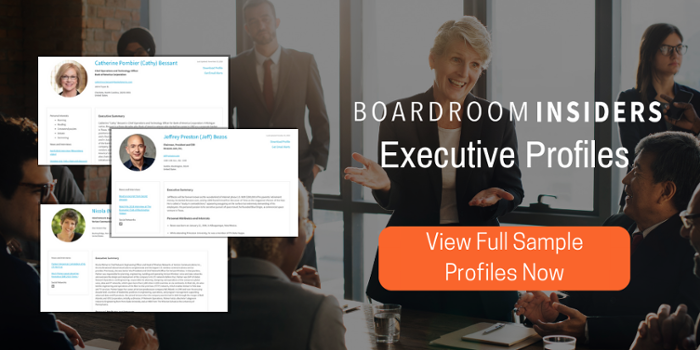 Boardroom Insiders can keep you in the know with exactly what your prospects, and the companies they work for, are prioritizing. 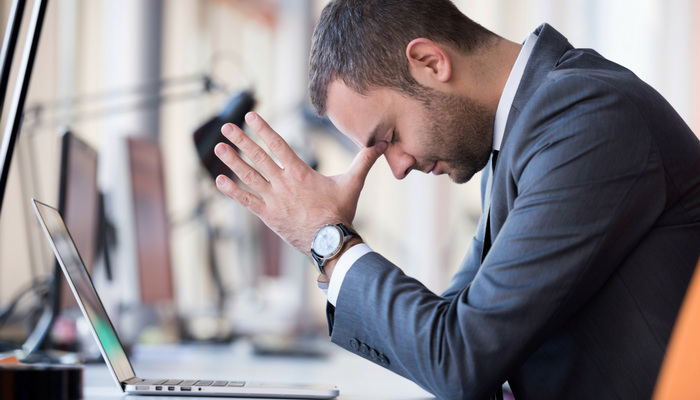 Knowing where their focus is can help you remain proactive instead of reactive, potentially gaining you business before an RFP is even considered. Want to know how? Check out our free sample profiles.